Manny Pacquiao and promoter Bob Arum were known as a highly successful team in the fight business for years. 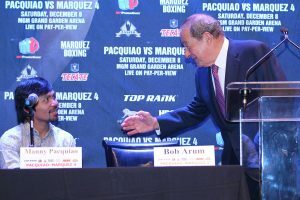 It was Arum who arranged the legendary fighter’s top matches, including the enormous payday Pacquiao earned from facing Floyd Mayweather back in 2015. Now, however, the relationship between the Filipino boxer and the octogenarian promoter looks to be close to beyond repair. For Pacquiao’s Instagram page had a message on Monday claiming that Arum’s Top Rank Promotions hadn’t paid Pacquiao for his victory of Lucas Matthysse last summer. The post, presumably penned by Pacquiao, also claimed that the matter was headed to court. “ Congratulations and good luck to @TRboxing and @ESPN on your 7-year partnership agreement,” the post read. “I know both of you have been very busy finalizing the deal. However, I have not received the US rights payment for my July 15 fight against Lucas Matthysse that was broadcast on ESPN plus. Therefore, I am initiating legal proceedings against Top Rank and all other parties based on the non-payment and attempt to restrict my future rights. Thank you.” While it’s true the fruitful relationship between Pacquiao and Arum looked to many to be heading to it’s inevitable end for some time, posts like the one on Pacquiao’s Instagram page clearly took the fight world off guard. Pacquiao, it must be noted, has been in a transition period for a while now. A Filipino senator, he only occasionally appears in the ring these days. He’s also widely considered to be past his prime as he pushes 40. Then there’s the matter of longtime trainer Freddie Roach, who Pacquiao refused to employ as trainer for the Matthysse fight. Reports claimed Roach not only heard about the break via the press, there has also been word that Pacquiao didn’t offer condolences to Roach after the passing of Roach’s mother. Relationships, perhaps personal as well as professional, seem to be evaporating in the twilight of Pacquiao’s career. content. While the fighter loves being the center of a crowd, the sometimes chaotic nature of Pacquiao’s public life can often make it difficult to discern fact from fiction. What’s in a name? 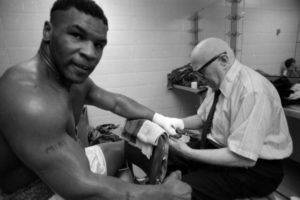 Apparently the make-or-break of a career according to “Iron Mike” Landrum Sr. who flied suit on June 30th for trademark infringement against Mike Tyson with whom he shares the same ring name. This is round two for the “Iron Mikes.” Both fighters now retired and in their 50’s have had vastly difference careers, though Landrum insists that this is strongly because of the confusion of who is who between the two men. Landrum is reportedly 6-4-1 in his professional career, though that record is not available on boxrecs and is hardly similar to Tyson’s record of 44-5-2. In 2010 Landrum attempted a similar suit, but it was dismissed for lack of merit. At the time, a case was also brought by Landrum against the Spike TV series “Knockout Sportsworld” for using the “Iron Mike” name but was dismissed early due to lack of timeliness in process service. Neither case ever saw a jury. There is no specific federal statue of limitations on trademark infringement cases and the limitation is left to state policy, but generally Nevada uses a four year statute (Aristocrat Technologies, Inc. et al v. High Impact Design & Entertainment, et al). The common law Doctrine of Laches defense is also available in Nevada when the defending party’s circumstances have been significantly changed due a delay in bringing the cause of action. So, maybe if Landrum would have sued 30 years ago, before “Iron Mike” Tyson became a household name he would have a much more realistic chance, but given the application of the doctrine it is unlikely. Neither the legal nor athletic cards seem to be stacked Landrum’s favor. In Jorge Castillo’s recent Washington Post story “Prichard Colón has been in a vegetative state since 2015 bout, but his parents fight on,” the sad reality that stems from Colon’s ill-fated bout in Fairfax, Virginia, is profound. He is “trapped” in a broken body. The term “Unresponsive Wakefulness” has been part of popular discussion as a result of the recent Otto Warmbier case. Castillo’s story revealed Colon is showing some response but he remains in a vegetative state. Now, almost 2 years removed from that day, the family lacks the resources to give Prichard the care that he needs. Governor McAuliffe enjoys the sport of boxing. Last February 27, 2016, before a rowdy sellout crowd at the Walter E. Washington Convention Center in Washington, D.C., McAuliffe watched D.C. native Ty Barnett return from a near two year layoff to take on trial horse Daniel Attah. It was a brutal bout that saw Barnett floor the journeyman 3 times as the crowd roared its approval. By Round 8, Attah’s shaky legs could not hold him up any longer. He kept falling to the ground, only to attempt to re-engage. The fight eventually ended after the referee had enough. It was Attah’s ninth loss in a row and a rousing return for Barnett. Nevertheless, the return of Ty Barnett was just a side note in a more significant story that McAuliffe bore witness to. 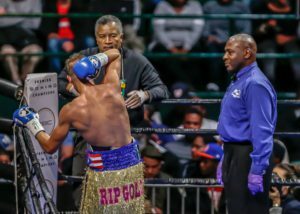 That event marked the in-ring return of referee Joseph “Thunder” Cooper, a man under heavy scrutiny for his responsibility in Prichard Colon’s present vegetative state. Was Governor McAuliffe aware that the last time Cooper refereed he donned a Virginia Department of Professional and Occupational Regulation (DPOR) patch for Colon’s ill-fated bout? Did he witness the more than 30 rabbit punches that left Colon in a persistent vegetative state? That nationally televised bout has been the subject of international scrutiny since Colon was left fighting for his life. Four days after Prichard Colon fought Terrel Williams, the Washington Post announced the DPOR had launched an official investigation. Consequently, Cooper was a focus since he was overheard telling Colon repeatedly – seven times – “you take care of it” as Colon protested the back-of-the-head “rabbit” punches. In the days that followed, the DPOR said it would investigate “the situation, the incident and the cause.” With a public campaign around the cause of Colon’s coma, why wasn’t Joseph Cooper on Governor McAuliffe’s radar that night? The optics are troublesome. 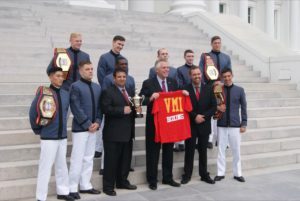 McAuliffe has kept a relatively high-profile in the boxing community, whether he’s seen out with the likes of Don King and Gerry Cooney or posing for photo ops with the VMI Boxing team. However, as Colon was left fighting for his life, he didn’t once acknowledge him. When Prichard Colon’s circumstances grew dire, many well-known personalities offered their prayers and concern. But McAuliffe was invisible. Why? It’s not every day so much attention is focused on Fairfax, Virginia. To be such a boxing fan that he would attend a small local boxing card, the idea that the Governor would not be aware of such a high profile incident seems a stretch. It’s also a stretch that Joseph Cooper would not catch his attention. At the time, Cooper was still perceived as a central figure in the DPOR’s public inquest. As a reporter following this beat, I was corresponding with DPOR Deputy Director Nick Christner regularly. On February 8, Christner assured me that their office was still investigating and they were just weeks from a conclusion. That proved to be false. It would be much longer before the DPOR released anything regarding these public efforts. English and Spanish media had been checking in weekly. In the meantime, McAuliffe sat ringside as a man that was under public scrutiny by his administration refereed another fight in Washington D.C. Nevertheless, the DPOR’s questionable document has woven its way into the narrative of the event. Commissions in other states look at rulings in other jurisdictions, so the Christner review offered the appearance of a pardon for the DPOR officials. Even though Washington D.C. hasn’t used Referee Cooper since the co-promoted Mayweather Promotions and Head Bangers Boxing card on April 1, 2016, the Chairperson for the D.C. Boxing and Wrestling Commission, Adam Weers, says the Christner review is a factor in whether to allow him to referee there. In seeking further clarification on why Christner pivoted so quickly on his stance that his review was not “an investigation trying to determine,” I contacted his supervisor Jay DeBoer, a legal consultant appointed by Governor McAuliffe as Director of the DPOR. His response raised more troubling questions about the DPOR’s capacity to regulate their boxing program. Essentially, DeBoer said the actions of his staff were beyond reproach or discipline, regardless of what Williams was permitted to do in the ring. Without explaining how over 30 illegal rabbit punches can be considered subjective, DeBoer deflected any and all responsibility, and avoided an important question: If no one with a Virginia DPOR patch on their shirt can be held accountable, why did their department go out of their way to absolve their employees in a faux investigation, which in itself was subjective? In the current national climate surrounding head injuries in contact sports, the answer to that question was obvious. As Governor McAuliffe has said, “Everybody in this public arena makes statements and gets interpreted different ways.” By releasing their ‘official’ report, the Virginia DPOR was attempting to muddy the narrative surrounding the fight as the number of critics continued to mount. To this day, their department has not released the files they based their analysis on. Even though DeBoer claimed his department offered their conclusions in the “spirit of transparency,” the interviews the DPOR conducted with Williams, Ashby, Cooper, and others remain sealed because the Colons refused to participate. We submitted a Freedom of Information request for the case file, which was subsequently denied. The contradictions that surround McAuliffe and the DPOR are incomprehensible. On the 5th of May 2017, ESPN’s Outside The Lines reported the Colons filed suit on ringside Dr. Richard Ashby for medical malpractice as well as event co-promoters Head Bangers Boxing and DiBella Entertainment, for negligence. When contacted by ESPN, the Virginia DPOR once again refused a Freedom of Information request to see their case files and re-asserted that the DPOR doesn’t license or discipline ring doctors and referees (or their Program Administrator, Holland). They claim the case to be still open since the Colons wouldn’t talk to them and added that their files were off limits to the public. Meanwhile, Governor McAuliffe has been equally evasive. He’s made no attempt to contact the Colons. No hospital visit. Not so much as a tweet. In the time he took to go to the fights in Washington D.C., he could have made either gesture. At best, McAuliffe has shown a remarkable lack of good common sense. At worst, he views these athletes as fodder, who are just good for entertainment. So, given the roadblocks that the DPOR has put in place, what are we to expect will change in Virginia? DPOR Program Administrator (acting commissioner) David Holland hasn’t had to answer for his actions that day. It was Holland’s claims that Prichard Colon was “stalling” and “faking” that had untold influence over how his staff performed that bout. Is it so unreasonable to conclude that his accusations might have persuaded the ringside doctor to ignore obvious signs of brain trauma, as Colon gestured to the base of his neck and complained of dizziness? How could they not? A system of accountability must be in place in Virginia. If just one official in Fairfax would have been competent, Colon would still be of sound body and mind. There is no place in professional boxing for Virginia DPOR Program Administrator David Holland. Unlike Governor McAuliffe’s Redskins, Boxers don’t have equipment to mitigate the lasting effects of illegal head blows. CTE and TBI is a very real threat. However, the Virginia PR campaign and its adherence to the status quo is an even bigger threat. The fact that the state has put no measures in place to ensure this will never happen again is madness in the current era of sports medicine. It’s almost as crazy as allowing Holland to remain in power as the acting commissioner of Virginia boxing. The idea this cavalier behavior would come from a Governor that has engaged the boxing community for public photo ops is unbelievable. Instead of sending out more propaganda, McAuliffe and his appointees should be doing all they can to make their rings safer. Oscar De La Hoya’s Golden Boy Promotions has lost a lawsuit worth hundreds of millions of dollars against boxing guru Al Haymon, and his Premiere Boxing Champions series. John F Walters, the judge presiding, dismissed the case without prejudice. This is an important moment for Haymon. After his PBC enterprise was said to be hemorrhaging the money given to it by hedge fund Wadell and Reed, big fights involving Haymon fighters have finally been scheduled. And now that he’s won his battle with Golden Boy, which accused him of being a manager AND a promoter (which is illegal) the enigmatic Haymon can breathe a bit easier. 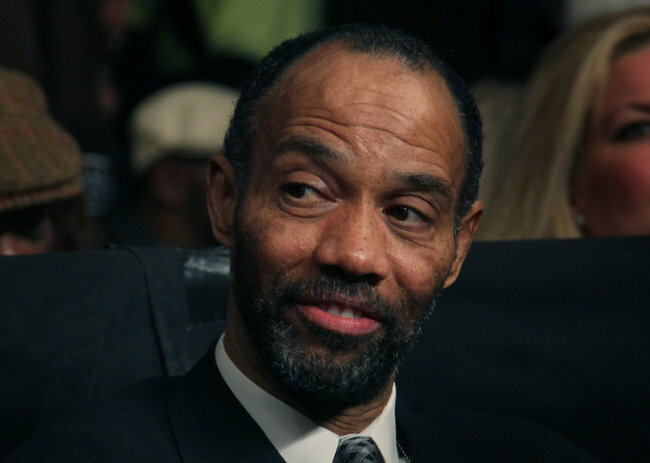 To be sure, Haymon, who doesn’t speak to the media, has been bombarded with allegations that he overpays his fighters (often for engaging in non-competitive matchups) and has worked to essentially create a boxing monopoly for himself and for his organization. He was recently sued by another competitor, Bob Arum’s Top Rank Promotions, but that suit was reportedly settled out of court. Things obviously did not work out so well for Golden Boy, however, which was defeated soundly in California’s Central District on Thursday afternoon.